Are you still annoyed about your untidy desk? Or losing desire to learn after seeing that mess of books? I think you need a good helper to organize books in this time!! Our bookends have 4 black pads down below to prevent slipping,can easily keep magazines, books, catalogs and binders neat in the bookshelves. Also you can use them to keep housing DVD's, video games, or CD's in the living room,will perfectly become a nicely decoration to your house at the same time!!! It surely will stimulate to the desire to read books after you see orderly bookshelf! Please be reminded that due to lighting effects, monitor's brightness / contrast settings etc, there could be some slight differences in the color tone of the pictures and the actual item. 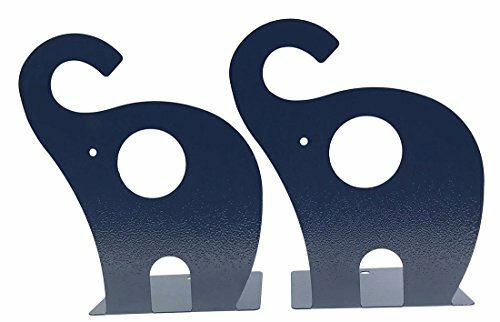 Elephant shape bookends,I believe that children will love them because of their lovely appearance!! Not only keep your books/CDs/DVDs/video games tidy,but also nicely decoration to your house. 4 black pads in the bottom provide sufficient friction to prevent slipping and keep scratches in minimum. Would be a great gift for book lovers.Keeping books in order to make your desk more tidy. Also a best choice for a back to school present.Stimulate their interest in reading. View More In Book Covers & Book Accessories. If you have any questions about this product by Arsdoll, contact us by completing and submitting the form below. If you are looking for a specif part number, please include it with your message.